Mark Haines is like the sometimes jocular, sometimes grumpy uncle who will call B.S. on that boy your sister brought home from college for the holidays the minute that little punk starts repeating cliches he heard in econ 101. 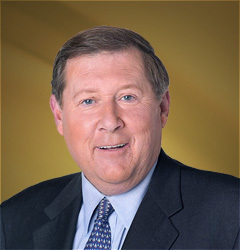 Born in 1946, Mark is best known as the host of CNBC’s Sqwawk Box and Squawk on The Street, which are the programs many investors and traders have started their days with religiously over the past 20 years or so. If Faber‘s the Brain, then Mark Haines is the Soul; there is no financial news anchor as equally suited to having a respectful discussion with a guest, while at the same time expressing the frustration of the everyman at the lack of accountability or originality in the corporate world. If you come on a show he’s hosting and sit there spouting your bull or bear talking points, Haines is going to call you out. He can also get indignant when listening to a member of either political party regurgitating the party line. What sets him apart from many of the other personalities on TV who refer to themselves as journalists, is that he does not offer his opinions about every little subject, he merely reports the news. These days, he’s got some colleagues that could afford to learn a lesson from the master.